Kaspars Putniņš and the Estonian Philharmonic Chamber Choir at Milton Court last night. Make Arvo Pärt the bulwark of any concert and you can surprise as well as delight the full house he’s likely to win you with the rest of your chosen programme. This was a beautifully planned showcase for the Estonian Philharmonic Chamber Choir under its Latvian conductor Kaspars Putniņš, poised between the introspective and the extrovert both within the all-Pärt first half and what followed after the interval, where Estonian composers no less precious than Pärt to their compatriots framed the late Jonathan Harvey’s mesmerising seraphics. And this Estonia 100 concert represented not just national pride but, with good enunciation in five languages, what makes this small Baltic country a paragon of doing right by the European project. It’s hardly surprising that in a land which every five years holds an outdoor choral festival accommodating anything up to 40,000 singers, there should be two professional chamber choirs of outstanding quality. Vox Clamantis’s all-Pärt CD, The Deer’s Cry, is among the three nominated discs in this year’s BBC Music Magazine Awards choral category, and it just has the edge on the EPCC’s equivalent, not least by virtue of its more varied programming. But you couldn’t fault the a cappella sequence of last night’s first half, from the 1963 Solfeggio – C major in the midst of Pärt’s early avant-gardism – to Dopo la vittoria composed for Milan in 1997, vigorous tale-telling of how St Ambrose broke into his Te Deum while baptising Augustine. In between, relatively inward religious works had their sudden blazes, above all in the glory of “the light to lighten the gentiles” in the 2001 Nunc dimittis, surely one of the best settings ever. At such moments, the penetrating focus of the choir is one of its most striking assets. A church – why not St Giles Cripplegate or the deconsecrated LSO St Luke’s? – would have helped to provide more ambience than Milton Court can offer, certainly. Perhaps a bit more phrasing from Putniņš and more word-consciousness wouldn’t have gone amiss in the repetitions of Summa, the Creed in all but name (such things mattered in Soviet Estonia). 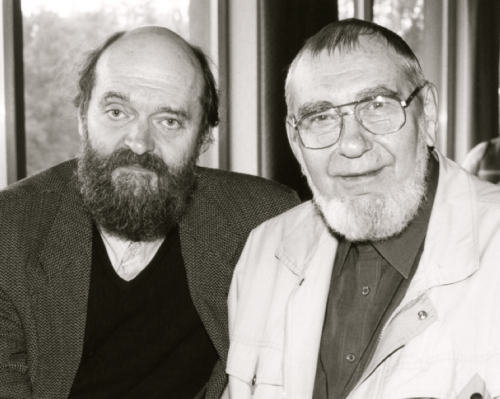 The narrative of the parable Zwei Beter, on the other hand, was beautfully inflected; what queasy harmonies Pärt (pictured above with Veljo Tormis) suddenly pulls out of his hat for the publican’s humble self-chastisement before God, in marked opposition to the showy self-regard of the Pharisee. Singing in their own intensely rhythmic language for the outer portions of the second half, the altos especially brought forth a tone you simply wouldn’t get with a British choir (and several, of course, are equally fine interpreters of Pärt’s more restrained music). My Estonian companion told me she gets a lump in the throat when she hears the lushly harmonised psalm settings of Cyrillus Kreek, which she sang often as a child. They made the perfect contrast to the plainsong burgeoning into dazzling, buzzing polyphony in the first of the Jonathan Harvey settings (the late, lamented composer pictured left by Maurice Foxall), a showcase especially for radiant soprano sound. More moving still was Harvey’s setting of a wonderful poem by John V Taylor, The Angels; the “chord of limitless communication” multiplies in the constant background to the unusual melodic lines. A masterpiece, surely. The same could be said for the two vivid folk-settings – one a succinct and ear-wormy encore – from Tormis’s St John’s Day Songs, in a dialect which most Estonians find hard to understand (there is also a string quartet version, numbers from which were played by musicians from the Estonian Festival Orchestra in Pärnu last summer). But its meaning is not; to what glorious adventures, sidesteppings up and down keys, Tormis submits the melody of “St John’s Song”. The stunner to conclude was Tormis’s Curse upon Iron, a primitive shamanic ritual complete with heart-stopping drum – brilliantly wielded by a chorister – to follow the likes of Prokofiev’s “Akkadian incantation” Seven, They Are Seven. The mutterings, whoops and wails of the choristers and the two splendid (uncredited) tenor and bass soloists had the desired hypnotic effect, but Tormis doesn’t just stick with one mode; we are jolted into the 20th century’s belligerent abuse of ores as the sopranos set off wartime sirens. Quite a way to end, with a timely warning over nuclear proliferation, and a job well done in terms of promoting another Estonian voice very different to Pärt’s – while Arvo thrives, Tormis, alas, died last year – to a spellbound audience. More Estoniana is around the corner for London this centenary year: watch this space.